With the Gate, Compression, and Stability knobs, this is far from an easy fuzz pedal to get to know. In fact, I found it quite difficult to find good, usable settings on my own. Luckily, the ZVex website has a few sample settings to try. Those work fairly well. Still, tweaking can be hard to do on the fly. How does one rate the sound of something designed to sound, well... like a fuzz pedal? The interesting thing it, this pedal tends to be more raunchy and nasty than most. There are many noise type players who would absolutely love this pedal. There are many other players who are looking for a classic fuzz sound that would be left scratching their heads and cleaning their ears after playing this one. Consider yourself warned. It seems there are as many fuzz pedals available as there are stars in the sky. 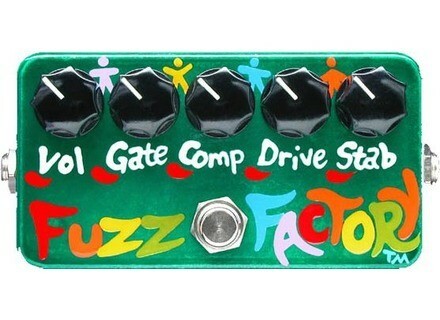 Everyone makes a fuzz pedal. This one is slightly unique as it doesn't appear to be based on a Big Muff. Again, that will be great to some and displease others. If you like a smooth, refined fuzz tone, this is not the pedal for you. If you like whacked out sticky gooey fuzz overload, this is one you might want to try out. As all things ZVex, the price is up there. Most times I find that the price is not justified. This pedal, due to its unique sound might be. I still think it's a bit too highly priced, but if it's a sound you like it will probably be worth it. It's probably better to stick with the less expensive Vexter series to save a few bucks since I believe them to be the same thing, just with a non-hand painted enclosure.